This article addresses current clinical applications, recent literature, and potential future applications of 3-dimensional magnetic resonance imaging (3D MRI) for musculoskeletal (MSK) applications. The main advantage of 3D MRI over standard 2-dimensional MRI is its ability to reduce partial volume averaging artifacts and create multiplanar reconstruction (MPRs) in any plane with any slice thickness from a single high-resolution isotropic acquisition. 3D MRI acquisitions are particularly useful for the evaluation of articular cartilage, which is prone to volume averaging artifacts, and for the assessment of longitudinally coursing structures such as peripheral nerves and tendons, which are better visualized with non-orthogonal MPRs. 3D MRI is also useful for surface and volumetric analysis of bone and cartilage for preoperative and longitudinal assessments. Current research is focused on decreasing acquisition times and automating segmentation through machine learning, thus overcoming some of the current limitations of 3D MRI and providing new applications for this technique. 3D MRI is widely used in MSK imaging today, and its use is likely to continue to increase in the future, with recent advancements focused on accelerated acquisition techniques and quantitative imaging. 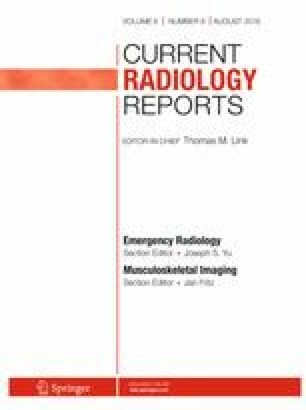 This article is part of the Topical collection on Musculoskeletal Imaging. The authors would like to thank Megan Griffiths, medical writer at Cleveland Clinic, for her help with manuscript editing. We would also like to thank Amer Hanano, MD, MSK radiologist at the Cleveland Clinic, Imran Omar, MD, director of the Department of Musculoskeletal Radiology at Northwestern University Feinberg School of Medicine, Xiaojuan Li, PhD, director of the Program of Advanced Musculoskeletal Imaging at the Cleveland Clinic, and Valentina Pedoia, PhD, from University of California, San Francisco, for providing images. Naveen Subhas reports a research grant from Siemens Healthcare. Faysal Altahawi declares no potential conflicts of interest.